It is crucial that wastewater treatment systems fulfill entirely their function so water reuse may be allowed as the ecosystems protection. Constructed wetlands are an ecotechnology to complement wastewater existing treatment systems or act as main treatment unit enhancing water quality. They are biological systems that intent to mimic biogeochemical processes that occur in natural wetlands in order to promote water depuration. 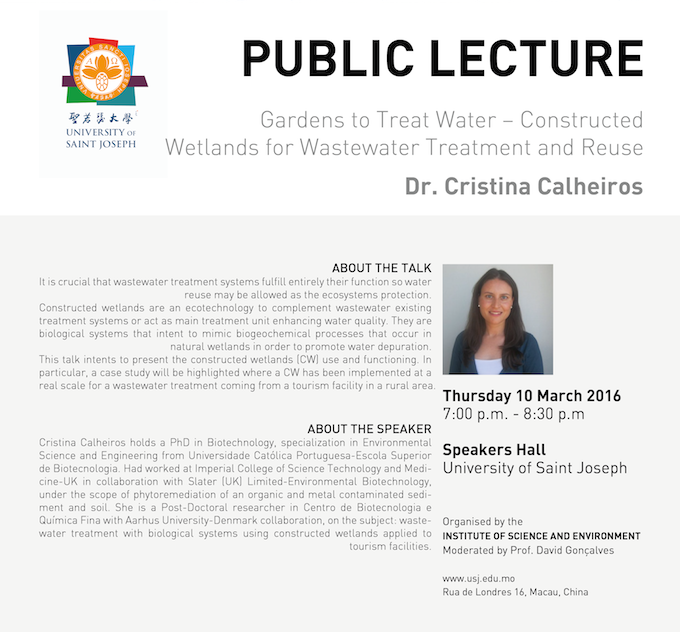 This talk intents to present the constructed wetlands (CW) use and functioning. In particular, a case study will be highlighted where a CW has been implemented at a real scale for a wastewater treatment coming from a tourism facility in a rural area. Cristina Calheiros holds a PhD in Biotechnology, specialization in Environmental Science and Engineering from Universidade Católica Portuguesa-Escola Superior de Biotecnologia. Had worked at Imperial College of Science Technology and Medicine-UK in collaboration with Slater (UK) Limited-Environmental Biotechnology, under the scope of phytoremediation of an organic and metal contaminated sediment and soil. She is a Post-Doctoral researcher in Centro de Biotecnologia e Química Fina with Aarhus University-Denmark collaboration, on the subject: wastewater treatment with biological systems using constructed wetlands applied to tourism facilities. She develops and active role in Science-Technology-Society communication through dissemination in papers published in peer reviewed international scientific journals, courses, exhibitions and multimedia channels.